Fourth Row Center: Film Writings by Jason Bailey: Backfilling: "For All Mankind"
Welcome to “Back-Filling,” a (semi) regular feature in which I see movies that, by any reasonable measure, I totally should have seen by now. "We choose to go to the moon,” President Kennedy said. “We choose to go to the moon in this decade and do the other things, not because they are easy, but because they are hard.” Al Reinert’s documentary of the Apollo missions, For All Mankind, begins with those words, and would seem, from that moment, to be exactly what we expect—a stoic, informative, straight-forward account of how we went to the moon. God knows we’ve certainly seen a fair number of documentaries on the subject—DVD commemorations, theatrical releases, countless TV shows, to say nothing of docudrama accounts like Ron Howard’s Apollo 13. But Reinert’s technique is refreshing; his film flies in the face of the countless space docs by adopting a fascinating, experimental approach. 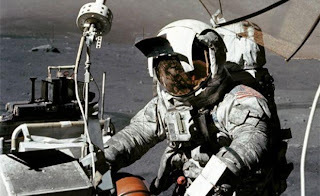 Instead of giving us the predictable, ponderous narration (“The tragedy of Apollo 1 behind them…”), Reinert abandons not only narration, but chronology. Instead of marching listlessly from one mission to the next, he creates a tone poem of a trip to the moon, intermingling all of the missions into an overall picture of a breathtaking journey, narrated by the men who took it. And their reflections are unusual as well—we never see them (there are no “talking head” interview shots), and their comments tend to deal more with abstractions than facts and dates. And the images are remarkable (even more so on Criterion’s carefully remastered Blu-ray release), drawing us in to the void of outer space and the unexplored terrain of the moon itself. For All Mankind has the makings of a dull History Channel special, and instead, it bends its footage and narrative to remind us of an extraordinary moment in human achievement. In Theaters: "The Yellow Handkerchief"
Backfilling: "The Wages of Fear"